The Holmsheidi Prison is one of 30 model projects of the Nordic Built principles, and embodies the principles in its design and function. 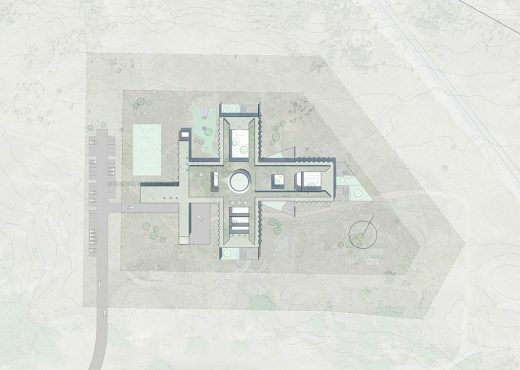 It is the result of rigorous consultation with the users with the aim of creating a sustainable prison from the standpoints of environment, social factors through the betterment of the inmates and economic factors. 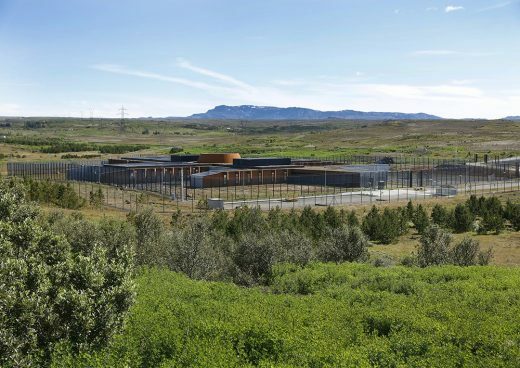 Holmsheidi Prison is located at the outskirts of Reykjavik and houses three prisons in one: a women’s prison, a short sentence prison and a custodial prison. The design team focused on creating a building of high architectural quality so that the overall character, form and material selection fits the function and compliments the surroundings. Furthermore, strong emphasis is placed on creating a framework for betterment of the inmates, good and safe conditions for inmates and staff alike and low operating costs. First is the central guard center, a round form that rises up from the building’s center, funneling daylight into the building. Second, internal courtyards are central elements to each ward. 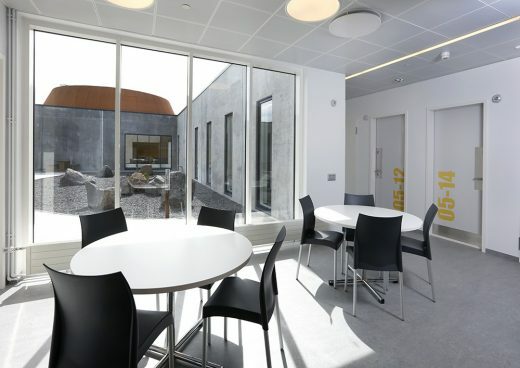 The courtyards distribute daylight into the wards, allow for outdoor recreation and in some cases prisoners enjoy views into the courtyards. The third element is the recurring prison cell extrusions. The extrusions serve a dual purpose. Providing each prisoner a view and daylight into the cell on the one hand and limiting views so that a prisoner cannot see the window of another cell or the exercise yard of another ward. The extrusions are both; an expression of the prisoner’s will to live again free outside the walls of the prison and simultaneously the limits holding the prisoner within. 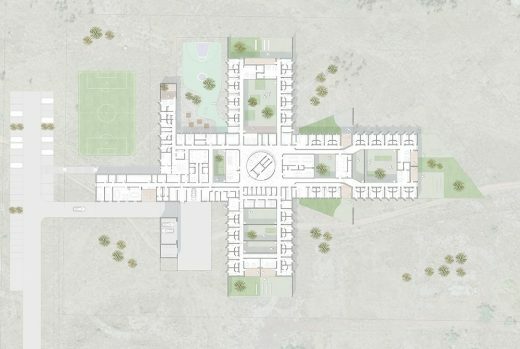 More importantly, client and design team have worked closely to create a prison that is sustainable from an economic standpoint for the building’s operations and from a social standpoint as an institution of human betterment. Material palettes are simple and clear, with an emphasis on durability and robustness. The design team carried out LCC analysis of key building materials and the final selection of materials is based on that analysis. 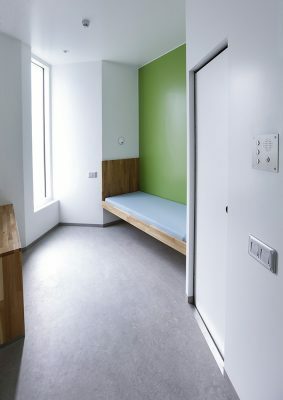 In addition an emphasis has been placed on selecting materials that contribute to healthy indoor environments for inmates, staff and visitors. 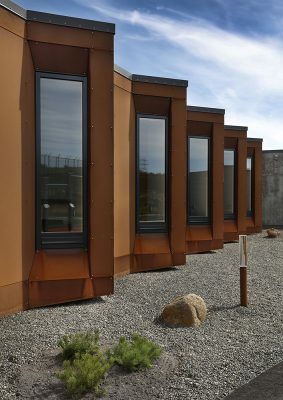 Concrete is the primary construction material, but the building is partially clad with weathering steel. In addition to a rigorous material selection process, building and site employ sustainable drainage solutions for the handling of surface water on site. 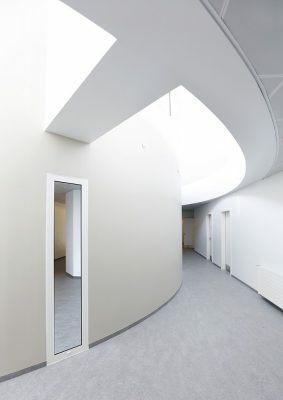 Furthermore, the design process has been characterized by a strong focus on the health and wellbeing of building users.